At Icing On The Ring, we're committed to pairing you with the finest jewelry available. This promise, to be your jeweler for life, extends far beyond the point of purchase. We aim to provide unparalleled service and offer ongoing maintenance — from resizing and refurbishing to upgrades, free shipping, tightening, and a generous return policy — for our valued customers. We proudly stand behind every Icing On The Ring piece and urge new and returning clients to let us know how we can be of service to you. Learn more about our promise and feel free to reach out with questions anytime. By choosing Icing On The Ring, you are assured the highest quality in design and craftsmanship. All Icing On The Ring products are warrantied against imperfections incurred during production. We certify that your center and side gems are securely mounted in the setting; should any gemstone fall out from its mounting due to workmanship defects, we'll replace it free of charge. Special care should be taken to maintain your Icing On The Ring jewelry. 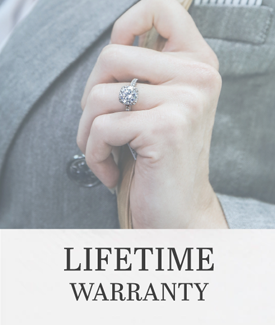 Warranty does not cover jewelry that is subjected to excessive wear, abuse, or physical damage, whether accidental or not. Loss of gemstone due to prongs catching, excessive pressure, roughness, or wearing down of ring. Discoloration of precious metals caused by chemicals, bathing, and immersion in pools and hot tubs. Thinning of precious metals, especially prongs, due to everyday wear (may require periodic refurbishment). Fees may be charged if repair work is necessary to preserve the integrity of your jewelry, including, but not limited to, ring re-curving, replacement of broken or chipped gemstones, and re-tipping of prongs. 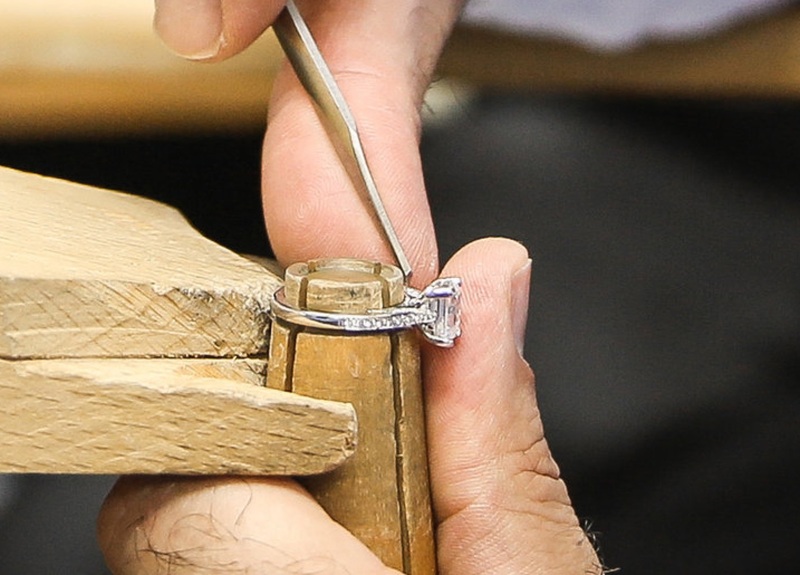 Warranty is VOID if your jewelry is worked on by another jeweler. Down the road, you may want to upgrade your icing. You may trade-up your center diamond, diamond stud earrings, and/or solitaire pendants purchased from Icing On The Ring for larger or higher quality diamonds. 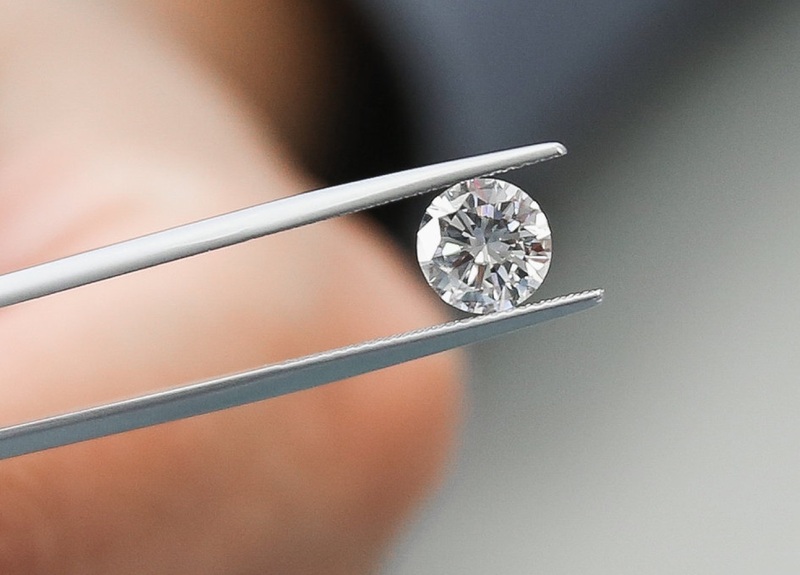 You may apply 100% of your diamond's purchase price towards an upgrade to a diamond that is at least 25% more in value and is of the same type (mined, lab-created, simulant, etc.). To qualify for a trade-up, the diamond must be in its original undamaged condition. Certified diamonds must be returned with their original undamaged certificate. Lots of things can change after a major life event, including your ring size. We offer one free resizing in the first year after purchase. To preserve the integrity of the ring, this complimentary service is only good within a full finger size, up or down. How it works: This service may take up to two weeks to complete. If you're in the area, drop off your ring with us and we will contact you when it's ready for pickup. If you can't come in person, ship your ring to us and we will cover the return shipping. Your jewelry is cordially invited to a free spa treatment once a year. 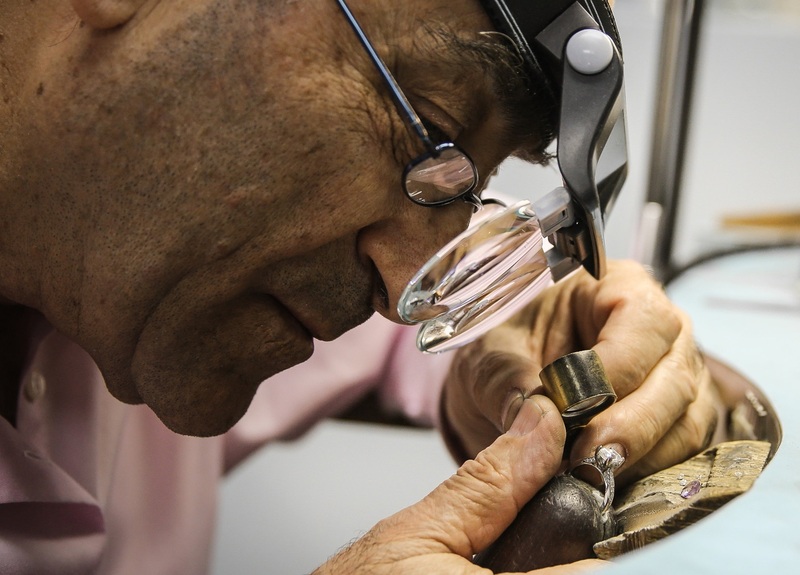 On an annual basis, we will resurface and re-polish your jewelry to restore the original shine and luster it had the day it became yours. How it works: This service may take up to three days to complete. 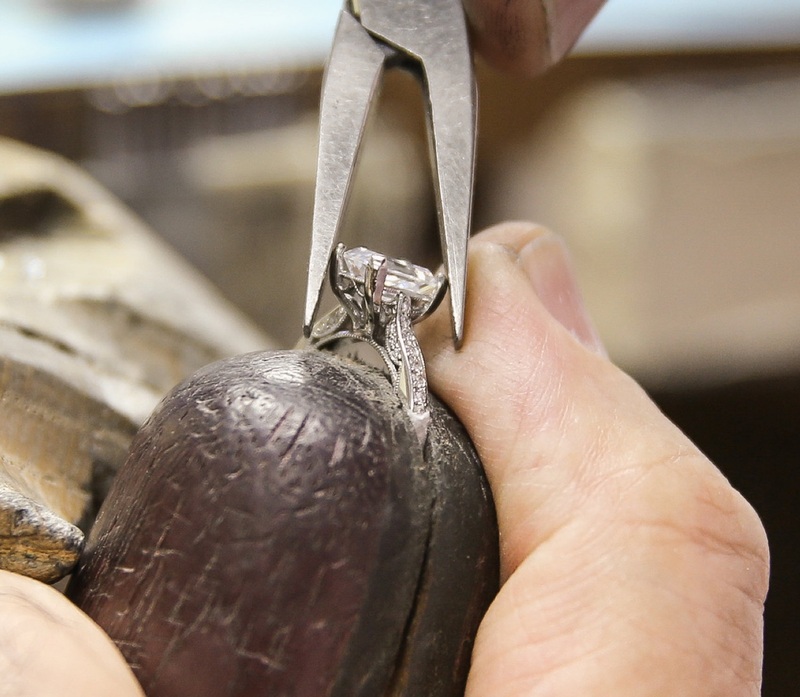 Stop by our store to drop off your ring and we'll contact you when it's ready for pickup. If you can't come in person ship your ring to us and we'll cover return shipping. How it works: If it's a quick fix, enjoy a beverage in our lounge as we repair the item in our production studio. Otherwise, we will contact you when your item is ready for pickup. A product sent through the mail will be repaired and shipped back to you within one week. Jewelry with center or side gemstones NOT purchase from Icing On The Ring are excluded from above warranty coverage & privileges. We ship your jewelry to you for free, regardless of price or distance. Non-customized orders placed online before 3 p.m. PST Monday — Friday will be delivered within 3 business days. Orders placed after 3 p.m. will be processed the following business day. All orders are shipped via UPS Next Day Air and you'll be notified when your order has shipped. If you've chosen to customize your design, your purchase is regarded as an Icing On The Ring Special Order. In this case, shipping times may vary dependent on the time needed to create your one-of-a-kind masterpiece. An Icing On The Ring team member will contact you with updates on your order throughout this process. To ensure the safety of your jewelry, we require an individual over 18 to sign for your package and we don't ship to P.O. boxes. Need to keep the delivery a secret? Ship to an address different from your billing address. We just ask that you have the alternative address on file with your credit card company. (To do so, simply ask to add an alternative shipping address to your account). Arrange for a Saturday delivery (additional fees may apply). While we do our best to ensure you are 100% satisfied with your jewelry, we understand that returns are sometimes necessary. We offer a 14-day full-refund return or exchange policy for any unworn items bought in-store or online. Items that are not eligible for return or exchange include items that show any wear, special orders (any item that has been customized to your liking), custom engraved jewelry, and jewelry that has been worked on by another jeweler. When does my 14-day period begin? Online purchases: from the day your item is shipped. Special orders processed online or orders requested with a postponed delivery date: from the date your order was first available to ship. In-store purchases and special orders: from the day your item is available for pickup. You may contact us to cancel your custom order within 2 days of the order date for a full refund. Make sure to hold on to all original documentation that came with your purchase. For an in-store return, simply bring your eligible item with its original packaging and documents during business hours and we'll process the refund or exchange. No appointment necessary. For online returns, call us at (888) 565-6510 or send an email to info@icingonthering.com. We will provide your Return Authorization code along with a pre-paid shipping label and instructions for packing, shipping and insuring your item. Your package must be postmarked within the 14-day return window. Your refund will be issued in your original form of payment and it may take up to 10 days to process. If you are exchanging your item, you will receive a credit that can be applied to your next online purchase. First — avoid returning an engagement ring because she doesn't love it by popping the question with a Proposal Ring. These are temporary solitaire settings that we place your center diamond into for the purpose of proposing. After the proposal, visit the store together (or contact us for an online order) so she may choose her dream setting. The full refund amount of the temporary ring will be applied to your purchase of the permanent setting. Learn more about Proposal Rings. While other retailers have a no-questions-asked policy, we prefer to know why you're returning your order so we can know what to improve. Customer satisfaction is our No. 1 goal. We will not accept items sent in without a Return Authorization number, packages shipped beyond the 14-day return period, packages that are uninsured or improperly packaged, or jewelry that is ineligible for return. We will charge a $100 replacement fee for loose diamonds that are not accompanied by the original laboratory grading report. If you have any other delivery requests, or questions about our shipping policies, contact us at (888) 565-6150. Need to make a return? We'll cover that shipping, too.